I finally finished a loooooon (years) overdue 1/72 plane for a friend. 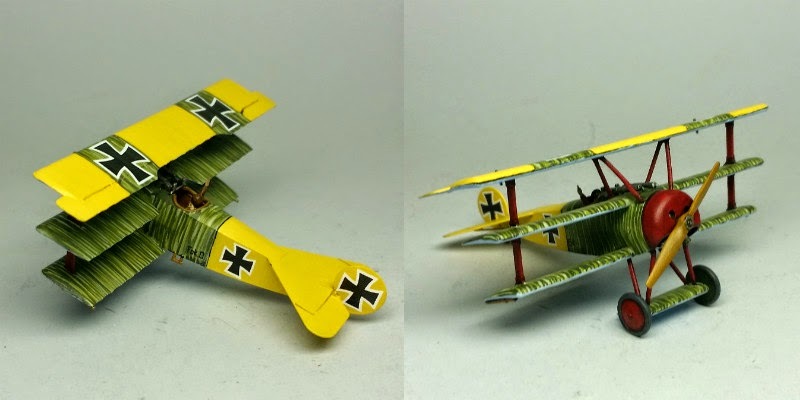 Lothar von Richthofen's DR1. The kit is from Eduard and probably the nicest plane model of this scale that I've put together. Lothar's plane is, I think, even more striking than his more famous brother's. Now that I've done this, I'm feeling a bit of the WWI bug again, and want to do a second one for myself. The planes are very nice. Not crazy about the segmented posts on the flight stands, but it's a better solution than was used in Angels 20/Axis & Allies. Very Nice. I´ve got a couple of DR1´s but not the Eduard Version...which reminds me..I haven´t built a stringbag for a while now. Great looking tri-plane. Love the "camo" work. I'm glad to have had a nudge to paint this, it was enjoyable and I like the way it turned out.